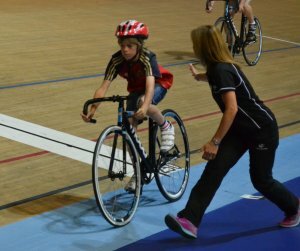 With Great Britain's continued success at the Rio Olympic Games, interest in track cycling continues to grow. 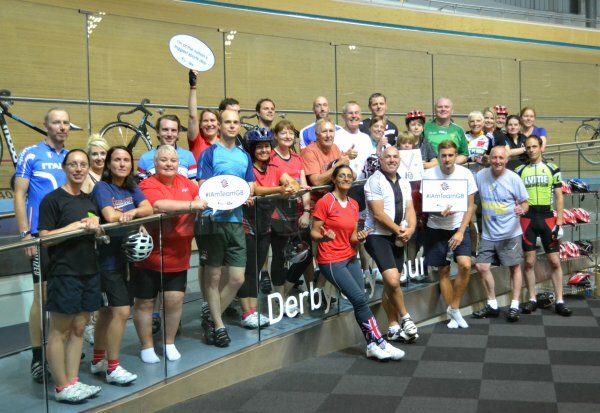 But while few who take to the boards are likely to emulate golden couple Laura Trott and Jason Kenny, it's nevertheless a sport that can be enjoyed by all the family, as Phil Kilpatrick, head track coach at Derby Arena, explains. Phil Kilpatrick leads a coaching session with beginners. 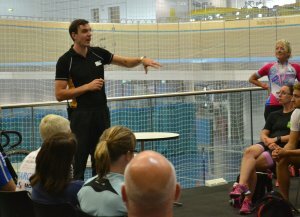 "We have got two pathways for people wanting to give track cycling a go. 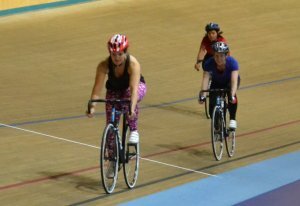 We have an out-and-out taster session for anyone who has never been on track and just wants to try it. 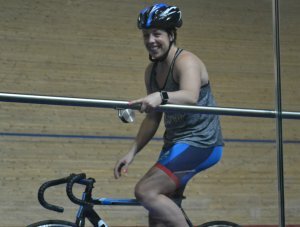 "We also have a stage one group for someone who is probably a bit more about their cycling who might not have tried track before, but is thinking about going on to train and race on it. "People can look at the banking and the speed and think it is a bit scary, but it's about taking it step by step and progressing gradually. You learn the bike control, how to stop and start and how to ride safely, starting off on the Cote d'Azur (the very bottom of the track) to build confidence and, only once you're ready, push all the way around that banking. 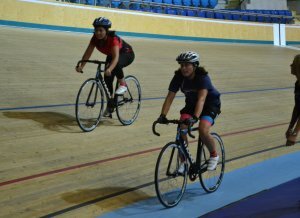 First time track cyclists receive expert coaching to overcome nerves. "If you are a little nervous, then bear in mind that the other 15 people are as well, so it's nothing to be worried about. We understand how everyone feels and so we coach the appropriate skills. "Most riders go away having had an amazing, exhilarating experience and have got up onto the track. You do what you feel comfortable in doing. "You need a certain level of fitness to get up onto the track proper, but that is something we can encourage and can give guidance on how to improve it – and you can still enjoy riding around the Cote until you get to the point you have built up enough speed. "We can send people away with little things to work on and then when they come back we can hopefully help them onto the track proper. Young people thrive on the track. "We have got family tasters on during every school holiday for nine years upwards. Some people ask why it's nine… it's partly the height because you have to be able to fit the smallest 39cm bike we have, which means you have to be 4ft 5ins. That's purely so your feet don't hit the 42 degree banking. "The other thing is speed. We want to keep cyclists coming back and if a child is struggling to get the speed up to get them up on the track, it might discourage them a little bit. "Most nine-year-olds are able to push for five or 10 minutes, get up onto the track, have a good experience and then come off for a breather. "That's what the family taster is about, learning skills in a safe environment at your own pace and a fun time, with the parents and kids able to have a go and have rests in between. We try to cater for everyone and those sessions have worked really well. "Promoting women-only sessions has been one of our biggest successes. We have set out what we wanted to achieve, which is to set out an established pathway for accreditation. "We have a range of different levels from complete beginners to intermediates and those more advanced – an SQT (Structured Quality Training), which is when you have built up some track experience and passed your accreditation, you can come and train with like-minded women. "The groups work really well and practice a range of skills. Some may never race, which is the beauty of it – it's just an enjoyable way of training and shows that it's not always race-focused on track. "The skills we coach can also help with a group on the road and also from a safety perspective because you are more observant and a better bike handler. "Some women have gone on to race and have done really well, racing around the UK. I would like to think that the majority of those women are from Derby, which shows what has been achieved so far. But the flexibility is there to get involved as much as you want." Go at your own pace women-only sessions are extremely popular. "We put on a para-session once a month and offer it to tandems with pilots which we can provide of you don't have your own, having trained up a range of pilots. "We also have solo opportunities and we may be able to modify the bike, whether it's a handle bar modification or using an amputee leg with a cleat fixed to the bottom of it. "We work with British Cycling so there are some performance-based riders in those sessions, but then we also have people who are coming along to have a go, including newcomers. 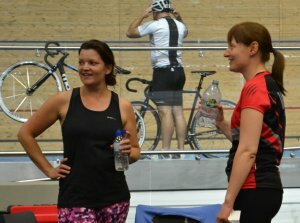 Track cycling puts smiles on faces! "The Rio Games – and London – go to show that success in sport really does motivate people to participate, whether they are venturing into a completely new sport or are just starting up again. "Following the track success in Rio, we saw 100 new enquiries within 48 hours and every time we do well at a major event there are surges. "The Olympics benefit every sport, but for those that are a little harder to access, including something like track cycling, it is really important – and we notice the difference. Listening in to a pre-session briefing. "I think Derby Arena can produce champions – and the next champions have already been on the track here and are riding regularly week to week. "Some of that is down to the unique nature of the facility. With there only being five in the UK, you are going to get a hub of talented athletes, but there has also been a massive surge from the clubs. "They have seen an interest on youth riders who are getting on the performance pathways. I would say Tokyo (2020) riders have ridden here, especially as we have a lot of road and track academies based here. All smiles during a track session. So when can you ride? "Monday morning and Sunday afternoons are the complete taster sessions and then we have the stage ones of getting accreditation on Mondays, some Tuesdays, Thursdays and weekends. "Sometimes there can be a small wait to get booked in, especially post-Olympics, but it is great fun and well worth it." Find out more details on the Derby Arena website or contact them on 01332 640011. 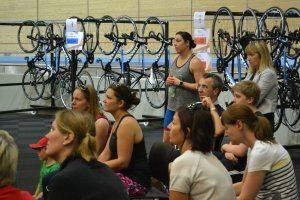 Women-only sessions are also run by Samways Cycles. Check out their website for more details. All smiles as a track group join together for a piccture, sporting their #IAmTeamGB banners. Derbyshire clubs, groups and organisations are being invited to help run the nation's biggest sports day - I Am Team GB. Hundreds of thousands of people are expected to come together for the campaign - on Saturday August 27 - by taking part in a range of free, inclusive sporting events. Click to find out more about how you can get involved.